If your business strategy has changed, there’s a good chance that your workforce doesn’t know it—and won’t be ready. Shifting business models, increased regulation, M&As, JVs, divestitures, expansion, and contraction are all the part of the “new normal.” And today’s business climate generously rewards operational scalability, elasticity, and endurance—all of which can only be achieved by having the right people and a deep focus on continuous workforce alignment and optimization. Yet there’s a huge problem: The widely adopted talent management “best practices” many HR organizations have in place are woefully inadequate in helping the workforce stay continuously aligned. For example, many organizations implement a performance management process that involves annual goal setting with an end-of-year review (and perhaps even a mid-year check point). Pretty standard stuff. In more advanced organizations, the performance results might impact or drive merit-based compensation plans. This “event” approach, while nicely integrated, is not very agile and makes the highly unlikely assumption that the business plan as defined at the beginning of the performance period remained static. Further, little or no focus is placed on valuing the skills and capabilities needed in the future, and the goal setting and rewards often lack the context of the true cost associated with delivering the work. In a post-recession, resource-constrained environment, “at any cost” is not acceptable practice. Business leaders always want to know costs. I believe HR organizations and people managers can and should do better for the business. To truly optimize your workforce, you must first make sure you have the right people. The right people will be able to quickly respond to the ever-changing business conditions. Broadcasting job opportunities and career development experiences in line with the business strategy. HR also needs to provide workers with opportunities to make known, and to easily update, their skills, education, experience, interests, current projects, performance goals, and work functions. Do I have my top talent working on my most important initiatives? Similarily, do we have the wrong people working on important initiatives? 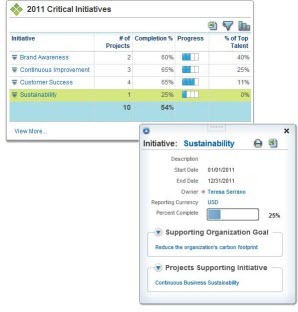 Do we know how much each initiative is costing the company versus the value it is producing? Do we know how well we are doing across all of our initiatives? Can we address any issues with laggards? Do we reward our talent for making adjustments quickly and easily? Are we enriching our talent pools with the capabilities necessary for future growth? Where is there considerable redundancy? I think it’s critical that organizations consider whether they’re focused on checking the boxes for certain talent processes, or on facilitating practices that keep their workforce tightly aligned to what is really happening in the business. It’s an important question to answer, as the difference between the two is woefully inadequate talent management, and demonstrating your organization is prepared to change with the times.